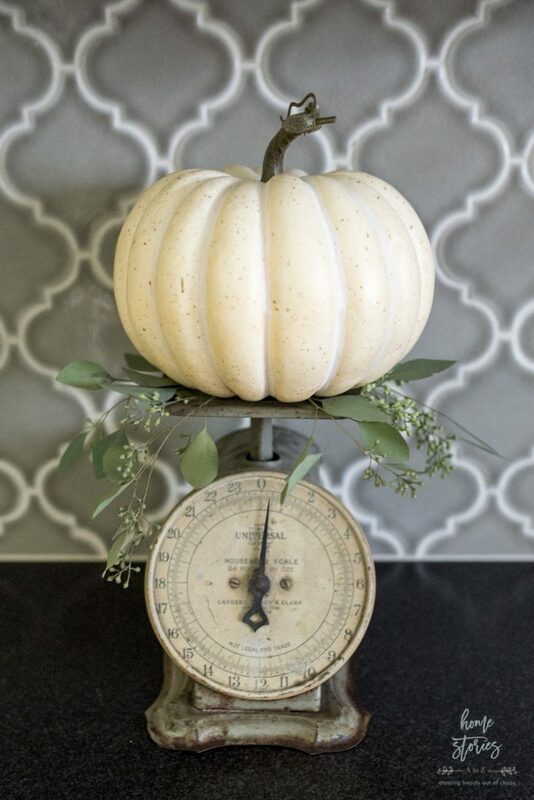 This fall home tour has several simple ideas for decorating your home using neutral fall decor. Happy Monday friends! 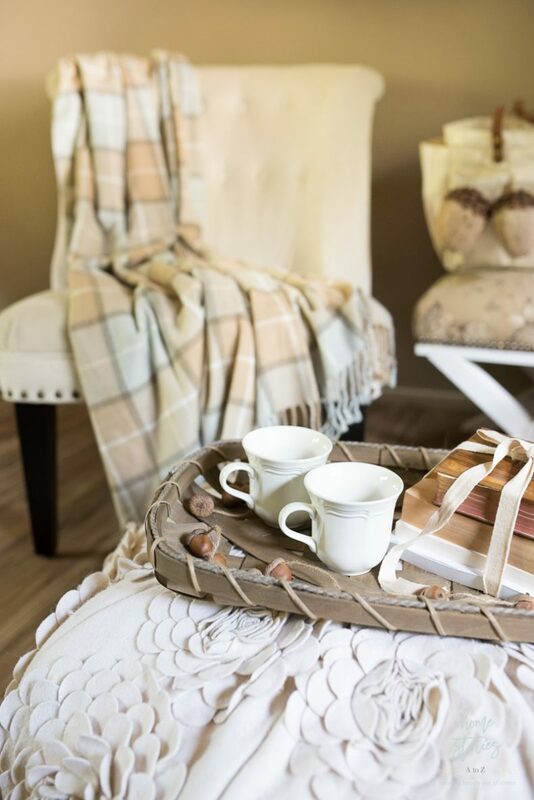 I hope the sun is shining and the breeze is cool today in your neck of the woods because whether it feels like fall or not outdoors, we are celebrating fall indoors today! 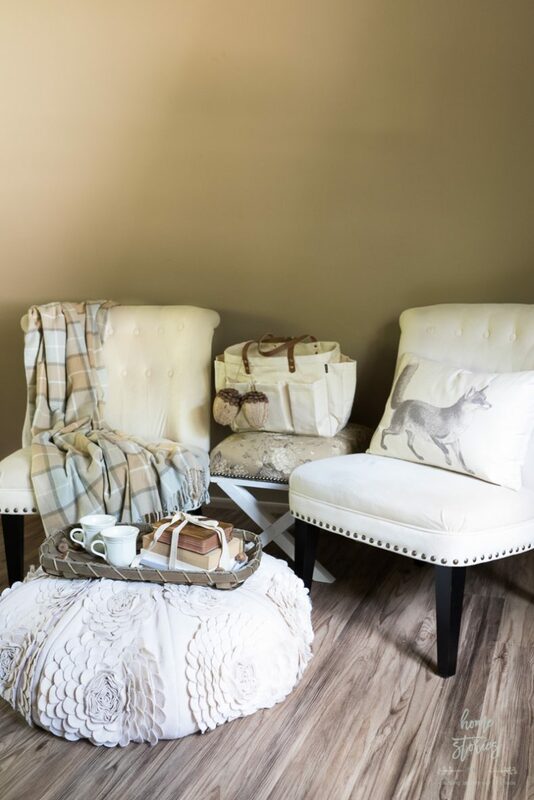 I’m excited to share with you a few rooms in my home that I spruced up for the season. This post is sponsored today by Shaw Floors, and I’m honored to be a part of this year’s Shaw Floors Style Board. You might recall that we recently had Epic Plus Wildwood engineered hardwoods in the color River Bank installed in all of the bedrooms. 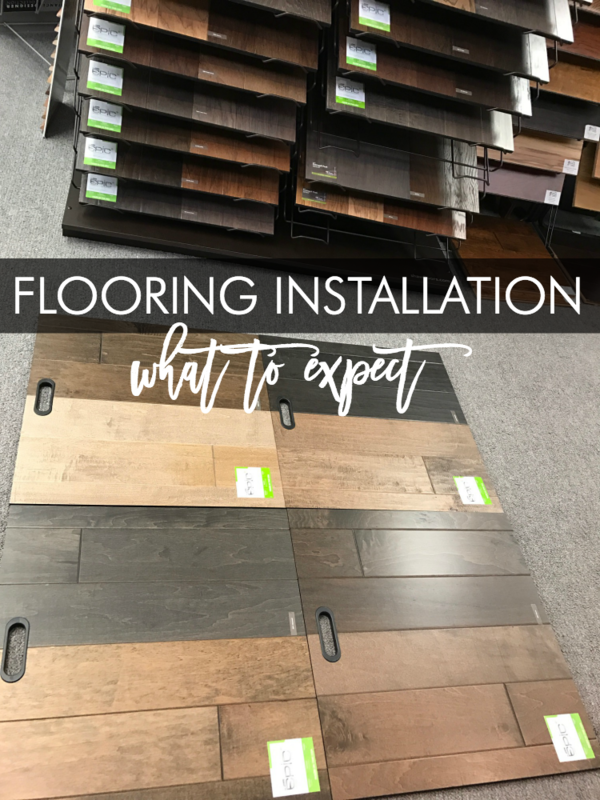 You can read more on my experience in my post Flooring Installation: What to Expect. After living with the floors for about a month now, I cannot gush about them enough! I love the texture, grain, color, and ease of cleaning. They are the perfect shade of chocolate brown without too much red or orange undertones. When choosing the flooring, I wanted the color to blend with our existing hardwoods but didn’t want them to be a perfect match. Our existing hardwoods are a dark espresso and I find them very difficult to keep clean. Wildwood in River Bank is a rich, warm brown with enough variation in the grain that dirt and dust do not show as readily. You can see them pictured below in our master bedroom! I recently shared our white master bedroom makeover here on the blog just a few weeks ago. I still need to install bamboo blinds on the windows and would like to install crown molding around the room, but otherwise I’m satisfied with how it’s shaping up! For fall, I switched out our white bedding for some Pottery Barn bedding that I purchased several years ago. Flooring pictured is Shaw Floors Epic Plus Wildwood in River Bank. Our bedroom is on the main level right off of the family room which has taken some getting used to! In our previous home our master suite was on the third level of the house and involved a lot of stairs–but had the benefit of a lot of privacy. The lazy side of me admits to enjoying the lack of stairs but missing the privacy! I don’t think I have shared any pictures of our family room on the blog or on social media yet with the exception of Instagram Stories. If you follow me on Instagram, you can see my stories (mobile devices only) and get sneak peeks of everything I’m working on and views of our home behind the scenes. It’s not as polished and pretty but it’s definitely more real. 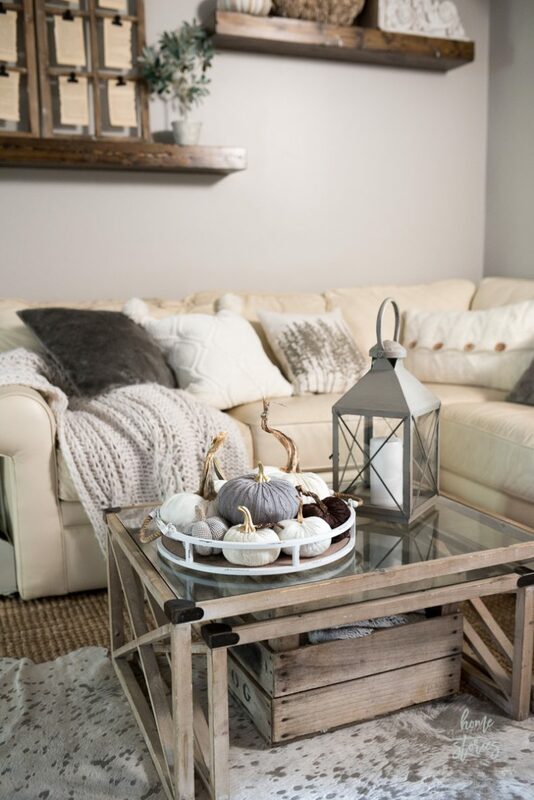 😉 This year, I kept our family room fall decor very neutral. After all of the chaos, clutter, and stress of moving I’m craving the quiet look of tone on tone. The previous owner’s built these fun floating beam display shelves, and I’ve enjoyed decorating them. 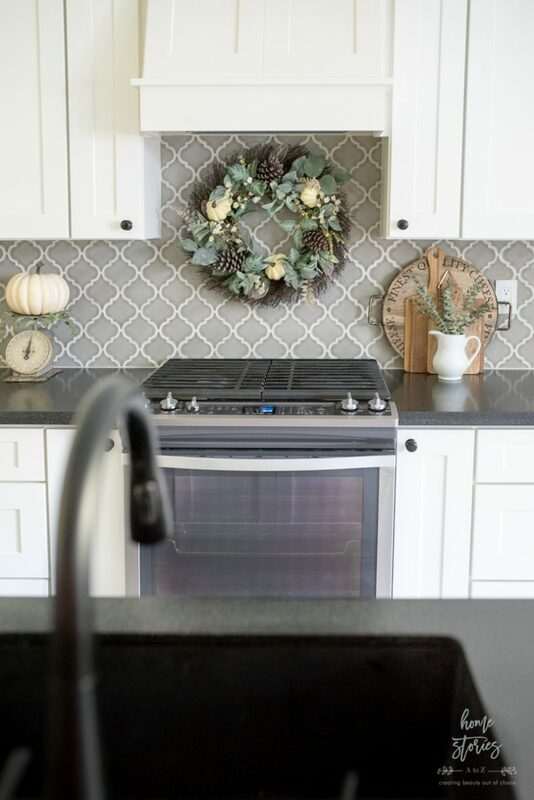 This is my first time posting our kitchen on the blog, and I’m excited to share it with you! I just hung those cute new lights over the weekend and am loving how they look. 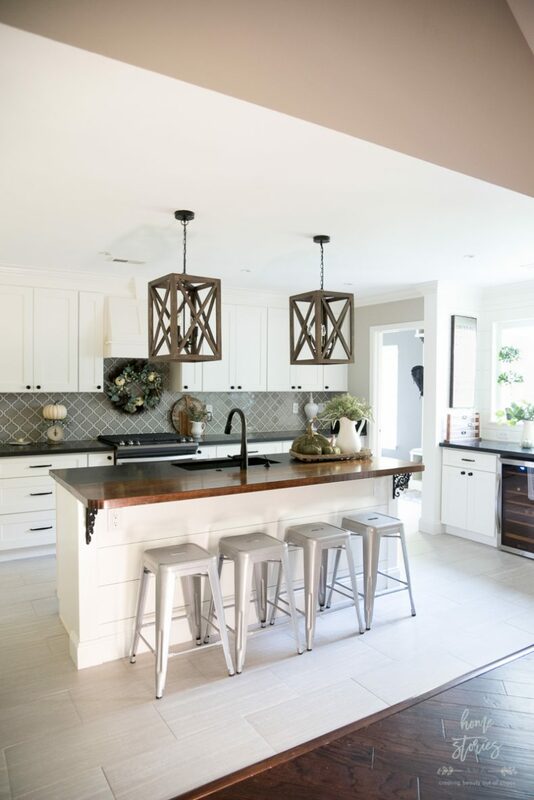 The previous light fixtures were fine, but didn’t do much for the space. 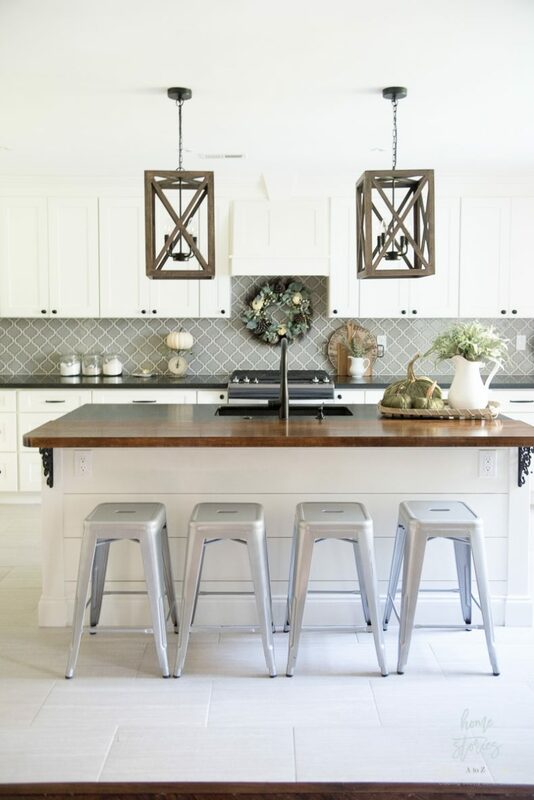 These are exactly what I wanted for in here to help bring in the warmth of the wood tones from the bar, floors, and beams. On the side of our kitchen we have a drink station which is so incredibly convenient and delightful! 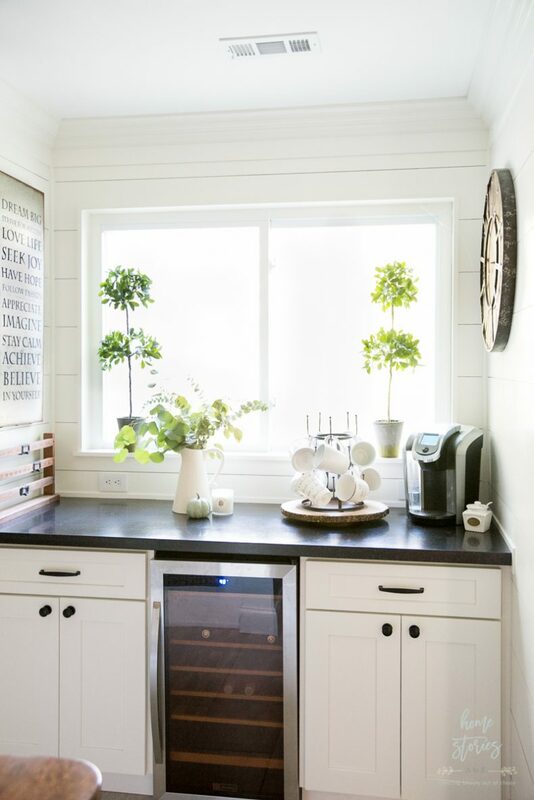 I love making coffee in the morning over in this little space and looking out into the yard and pasture. It’s a great way to begin each day. Right off of the kitchen is our mudroom and laundry room. 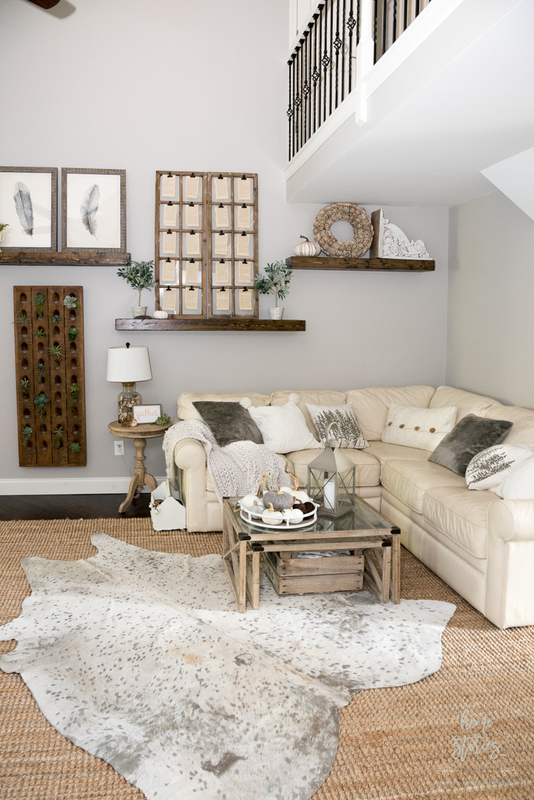 This room just received a makeover and you can see more of it here. 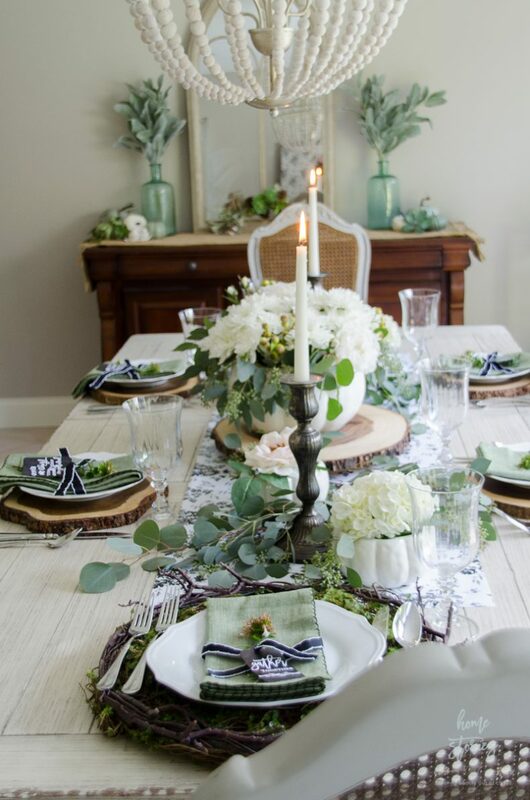 I’ve shared our dining room a few times on the blog since we moved in, but if you missed my Elegant Black, White, and Green Farmhouse Table Setting for Fall go and check it out! I have a free download for the fall chalkboard tags for you. Unfortunately, we still have 5 rooms in our home that are nowhere near ready to show off on the blog but I’m working on it! We also have an adorable outbuilding in our yard that we call “the barn” that is waiting for a full makeover. I had hoped to paint the barn walls and have it more “show ready” for this post, but hurricane Irma and life in general had other plans! We did install new flooring in the barn and I absolutely love it! It’s Floorte luxury vinyl Largo Plank in the color Taburno. It’s the perfect rustic look for this two-story barn and once the walls are painted white it will really pop! For now, this space is a great reading nook and a cozy escape from the main house! 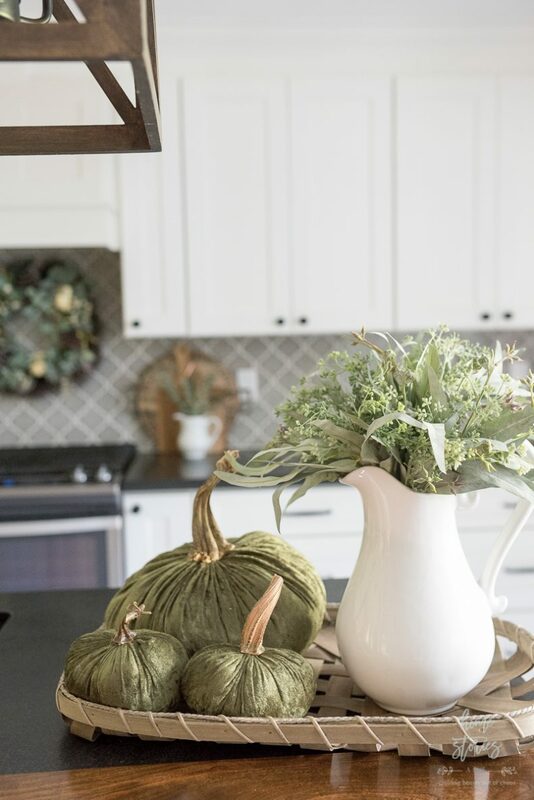 I hope you enjoyed my fall home tour! Thanks to Shaw Floors for sponsoring our tour! Next up on the tour is Rhoda from Southern Hospitality. Rhoda just moved into her new home a few weeks ago and installed some beautiful flooring and a gorgeous stair runner from Shaw that you have to see. It will be fun to watch her put her magic touch on her new home. 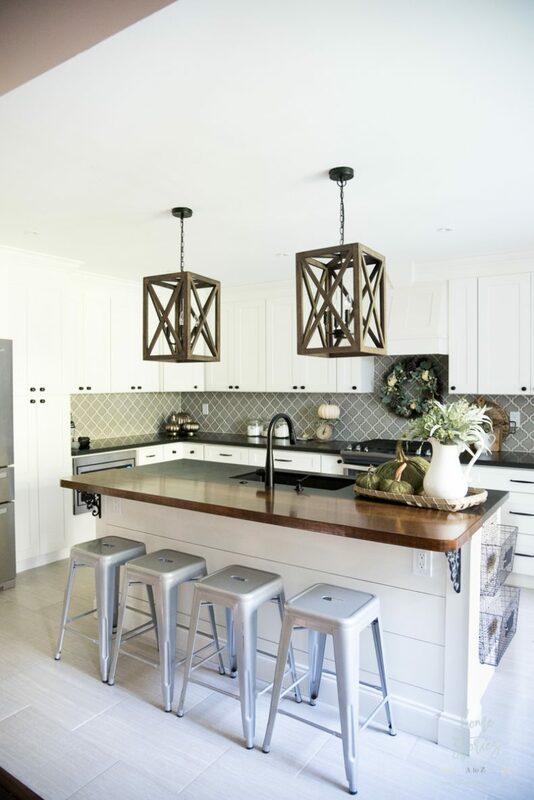 I LOVE your wooden boxed pendant lights over the kitchen island!! We are remodeling our entire house due to flooding from Hurricane Harvey 🙁 I need those lights!! I’ve searched all over the internet…where did you get those?? Thanks!! 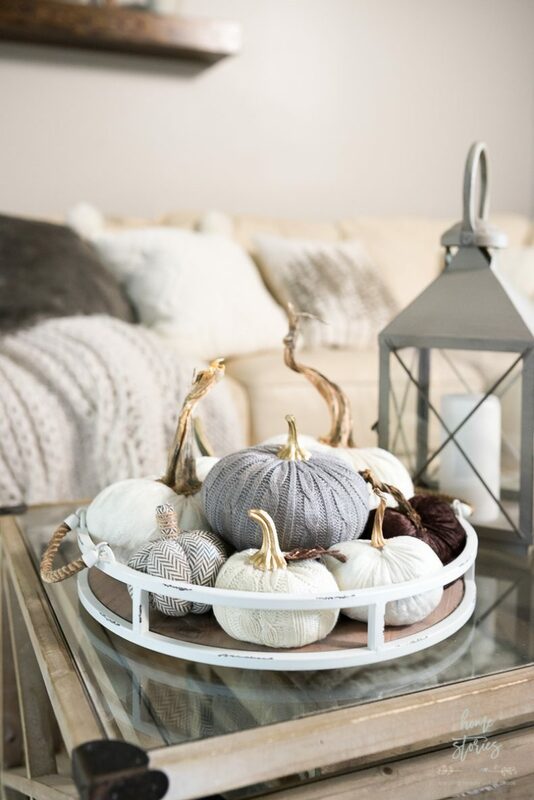 It’s easy to dress up neutrals with your fall décor! 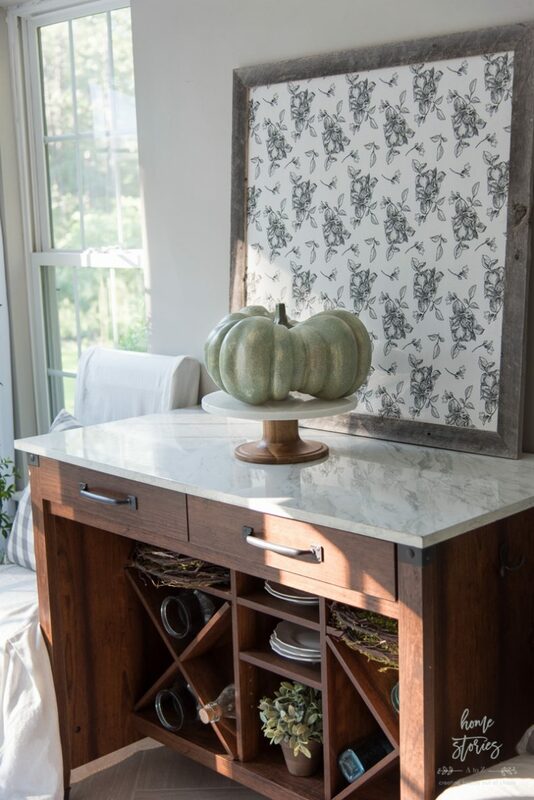 Not only do they offer a great backdrop for your home, but they also contrast well with some of the bolder fall colors. 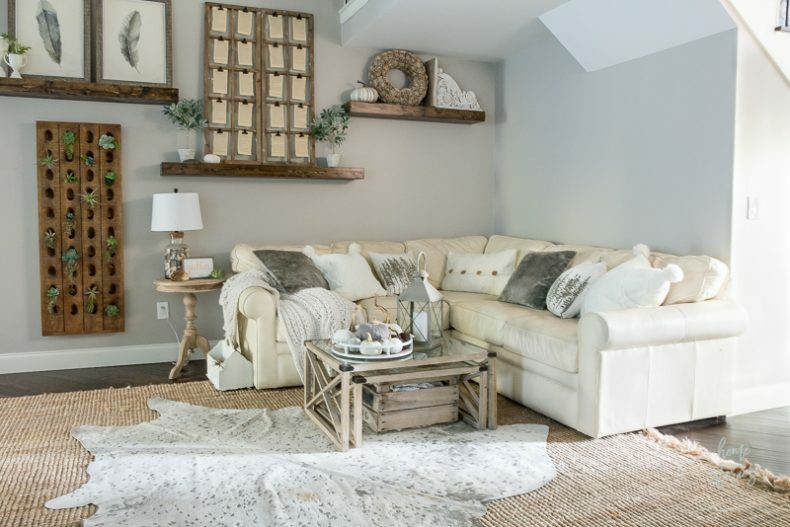 Neutral home décor is amongst the most versatile. 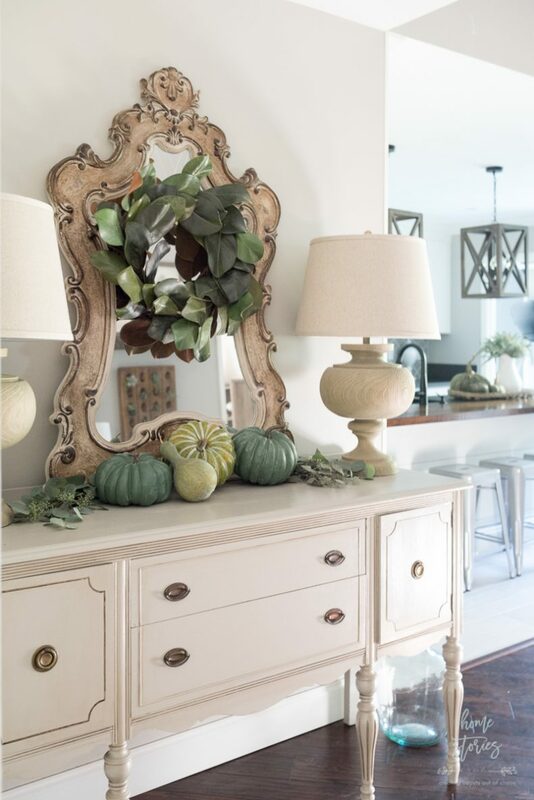 It’s not only good for the fall season, but it can enable you to transition your décor to other seasons, as well. 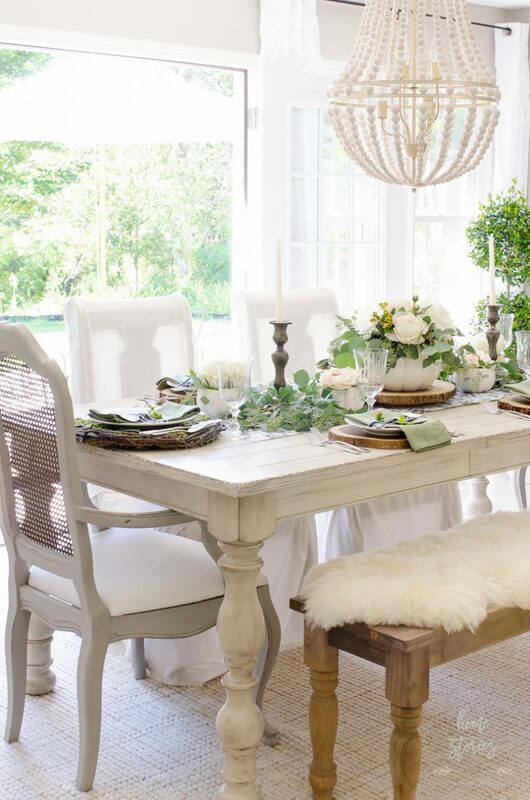 WOW…where can I get that white flowered cushion…OH MY it is perfect!! I just love how you decorate! I have a question, your table is exactly the stain/shade I would like with mine. I have a large Pottery Barn trestle table but it is a dark stain and I would like to change that. Did you change yours and if so how did you do that? And what “color” or shade is it? I have been quoted a 1,000 to either paint or re-stain ours and that is huge amount. Thank you! 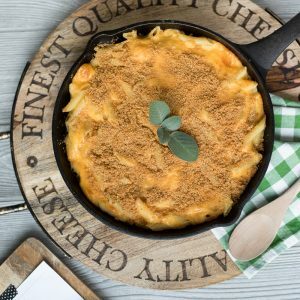 It is so timely that you are posting pictures of your new home. In fact, I was thinking about you/your blog just yesterday and wondering when we would see more of your beautiful home creations. And, girl, you delivered. I love it ALL!!!!!! Thank you for sharing! Your home looks stunning! I can see a lot of hard work has gone in to it! I am excited to see what you do for Christmas! Not too soon though! I’m impressed with everything you’ve gotten done in this new house. I’d missed the updates. It looks gorgeous! I’m swooning and drooling over everything Beth!! So much gorgeousness my friend! Everything is beautiful, Beth! Love the floors! We desperately need new hardwood and carpet too!